While catching snippets of Charlie Sheen's tirades on tv recently.. I was surprise that "The Wraith" has not been mentioned more. 'The Wraith of Charlie Sheen' seems as if it would be the perfect title of his sold out shows. The first thing that most folks probably think about with regarding to "The Wraith" is that wicked but unusal car. This car was actually a prototype from a joint venture between Dodge and Chrysler to develop the ultimate high performance vehicle. 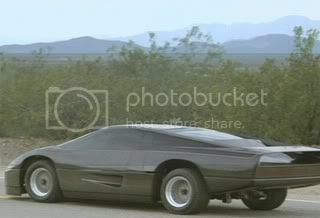 It was called a Dodge M4S and had an estimated cost to build of 1.5 million dollars. A very cool auto for its time indeed. The plot of "The Wraith" is quite simple.. it is a story of vengeance intertwined with an excellent love story. The movie will play out exactly as you will expect it to, however you will still be entertained by some of the best pyrotechnical work I've seen. The explosions were many and almost jaw dropping. For me, though predictable.. the final scenes of the movie were kinda touching and good payoff after all the action. 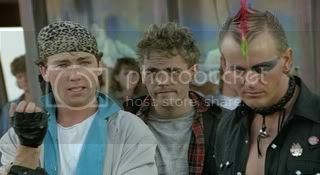 The cast is 80's stellar.. Charlie Sheen, Sherilyn Fenn, Nick Cassavetes, and Randy Quaid lead it, but Chris Nash, David Sherrill, Griffin O'Neal, and especially Matthew Barry are the nuggets that 80's fans like us are seeking. Actually, though it was for only a few seconds, one of my fav finds in "The Wraith" was the beautiful Brooke Burke. I've already mentioned some great reasons to watch "The Wraith", but the true star of this engaging flick is actually the soundtrack from artists like Lion, Billy Idol, Robert Palmer, Ozzy Osbourne, and Honeymoon Suite. And Ronnie.. there is a tune by James House in "The Wraith", but it in no way resembles the greatness he achieved with "I'm In It For Love". Finally, though I might not ever want to eat there after seeing the grilling area manned by Billy Hankins .. I totally thought Big Kay's was just 80's awesome! Classic! One of the best movies ever made. Great sound clip too Valley!! Thanks Muffy !! And aTomiK that is a bold statement! "The Wraith" is a fun movie that I hadn't watched since the 80's. I got a great deal on the DVD, but just noticed it was free on imdb.com for anyone that might be interested. Too bad I'm not in love with a girl with blue eyes because that excellent tune has stuck with me since watching the movie this morning. I love this flick too and am glad I bought my dvd before the prices for it got out of control. Great soundtrack as well! •"SMOKIN' IN THE BOY'S ROOM"
Courtesy of WEA Music of Canada, Ltd. Courtesy of Chrysalis Records, Inc. Here's "Where's the Fire".... awesome tune and video! Here's "Never Surrender" by Lion"
Here's a cool Youtube video featuring "Secret Loser"
this movie is an 80's classic. one of my favorites. seconding muffy's call on the sound clip, well done and seconding Atomik's call on a 'classic'...this movie is definately more popular with me now more than it was back then. The thing about these action/thriller/sci fi oh for god sake whatever genre it is, ... it lacks substance, it lacks depth, some of the lines are just terrible and so unlike st elmos fire it worked because all that filling is just not needed in this film to make it work. Explosions (as per Valley said), Brook Burk (for about 3.2 seconds) charlie sheen on a motor bike, a ridiculous looking but at the same time, awsome looking car, a pair of er umm ahhh hmmm dweebs, an illiterate sheriff and a tale of revenge - its just like 'The Crow' on wheels. 2 thumbs up and now my Monday night is booked! Awsome. I've just bought the special edition DVD as the first release had poor picture and sound. Great movie with an even better soundtrack. those links for the songs are awesome. 'where's the fire' sticks in my head with just one listen...i end up singing it for a couple of days haha. valley, isn't it crazy, james house is all over some pretty good 80s movies, with great tracks, but you're right, 'im in it for love' is his best. i always liked skank and gutterboy..those guys were a hoot..
gonna have to watch this soon, because it's been forever. thanks valley! watching this in a matter of 3 hrs time...looking forward to it thanks to this thread . . .kudos to Valley. Brooke Burke .. from The Wraith to Dancing With The Stars ..
so i got a chance to watch this last night. i couldn't help but bop my head to all the tunes, especially the racing scenes. Nick Cassavetes, who played Packard, has directed a few note worthy movies. Charlie Sheen and Randy Quaid's lives sure have gotten pretty interesting lately, right? skank and gutterboy have done a handful of movies together, small roles of course. i had completely forgotten about Chris Nash being in this. i remembered all the others except him! we've seen him in Modern Girls, Satisfaction, and Mischief. i remember when we were watching April Fool's Day and i spotted Griffin O'Neal. in all the times i have seen AFD, i didn't put the two together until that night. plus, had no idea he's Tatum's brother, son of Ryan, until you guys said that. good trivia. it was great to hear the story behind the car. loved how classic it looks from the back and how it rides low in the front haha. like Veronica said, the cinematography is great,...another movie filmed in Tucson! glad i watched it,...it's been a while. The thing I noticed most when I last watched it... is that Sheen is only onscreen for about five minutes. What's the betting they got him for his name but could only afford to hire him for about two days? A while back I saw "The Wraith: Special Edition" DVD from around 2010. Excellent picture quality & nice anamorphic print (and far better than the pan & scan P.O.S. DVD that we had before). For whatever reason, I completely missed this back in the '80's, and wasn't even aware of the film until someone recommended it to me in the 200X's. Great movie - it bore a lot of similarities to Clint Eastwood's "High Plains Drifter" & "Pale Rider", i.e. a mysterious stranger shows up in a small town, throws his weight around with the local toughs, and strongly reminds people of someone in their past - the scars on Sheen's back are also very similar to what we saw on the Eastwood character in PR. I have 0 issues with Sheen's absence from most of the film. The way I see it, the whole point of the film was that the motorcycle rider (the Sheen ghost) was meant to be mysterious & unseen for most of the movie. 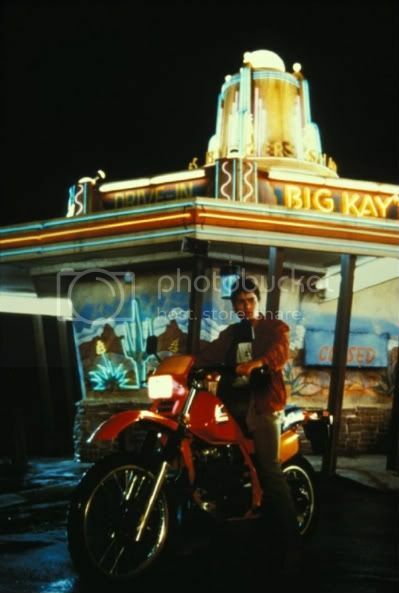 I want to visit Big Kay´s! The Wraith remains one of my favorite "Get up and watch on Saturday Morning as a child" movies. Randy Quaid is underrated is this movie. Rewatched The Wraith last night and it's as awesome as ever and that is seriously one cool car that Sheen's character drives plus Sherilyn Fenn here looked absolutely gorgeous! Great tunes as well that really get your feet tapping and the movie moves along at a cracking pace! I agree with the majority of the folk on here in that this is one hell of an entertaining watch! https://youtu.be/gHlQVKf2Ofs - Extremely cool opening credits to The Wraith (1986).